Small dogs love a meaty taste! So treat your special friend to the satisfying flavour of a tender, melt-in-its-mouth filet mignon meal. This pâté-style filet mignon flavoured loaf provides complete, balanced nutrition and a source of moisture that can be beneficial to small dogs. Gram-for-gram, wet foods like the CESAR® brand have fewer calories than dry food. Paired with CESAR® Dry food, the 100g serving makes a perfect meal for small dogs. 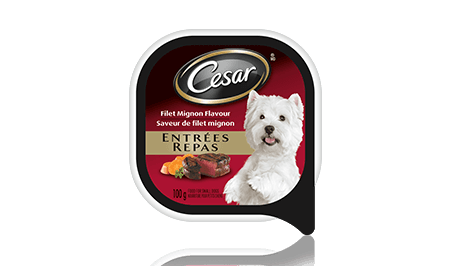 CESAR® ENTRÉES: FILET MIGNON FLAVOUR 100g is rated 4.4 out of 5 by 56. Rated 5 out of 5 by OLGASMB_3541431920 from My Yorkie Boomer is a fussy little dog so I was not expecting him to like something new. I do feed him Cesar but mostly the home delights in chicken flavor. I was most pleasantly surprised that he gobbled it up on the first try without even smelling it first! He licked the dish CLEAN which is quite uncommon. I always mix wet food with the Cesar dry and this is quite a winner combination..I highly recommend this for fussy little dogs who turn their little noses up to most foods. Rated 5 out of 5 by CAITLINCON_3541427153 from The packaging of the product was very good. Sealed nice and tight so nothing bad gets into it. As soon as I was taking the seal off my dog rushed over to it I guess the aromas from it were strong enough for him to smell it. He ate it pretty quickly. His stomach also didn't get upset by it which means it's very digestible. My dog is a chihuahua so a lot of other brands tend to make his tummy sick. Rated 3 out of 5 by GINAOON_3541442729 from My dog is a fussy eater. The look of the product was more appealing to humans than my dog. I'm sure they are trying to make dog owners think the food is the same as human grade food so they feel better giving it to their pets. I'm sure if my dog was starving or if I had a dog than ate anything then she would have eaten it. I would recommend it because of my dog being so fussy. Rated 5 out of 5 by LISASON_3541439651 from I found the appearance of the food eye appealing, it looked like real chunks of beef and the smell was very good. I had no problem serving this to my dog and she definitely loved it. Without hesitation she quickly ate the whole portion. I liked the portion size, not too big and just enough for one serving so there was no left overs. Definitely recommend. Rated 2 out of 5 by TIFFANI_WBC_3541439343 from My dogs love anything they're given. I was really excited at first, but when I looked at the ingredients, I was very disappointed. I understand this is a value brand, but I was hoping for more quality considering that this is food that a family member consumes. One of the first ingredients was meat by products which is something I aim to stay away from. CESAR® Entrées Filet Mignon Flavour Food For Small Dogs is formulated to meet the nutritional levels established by the AAFCO Dog Food Nutrient Profiles for maintenance. MEAT BY-PRODUCTS, LIVER, BEEF, CHICKEN, CHICKEN BY-PRODUCTS, MINERALS AND VITAMINS, COLOUR, GUMS, DRIED YAM, NATURAL FLAVOURS, FILET MIGNON FLAVOUR, SODIUM NITRITE (FOR COLOUR RETENTION), WATER SUFFICIENT FOR PROCESSING.